Caregivers report “communication difficulties” contribute significantly to the stress and burden of caring for persons with dementia. Susan Kohler, MS, CCC-SLP, licensed speech pathologist, shares her experience and knowledge of communication strategies in caring for this population in her new book, How to Communicate with Alzheimer’s, A Practical Guide and Workbook for Families. Readers will learn about the communication process, why it is so important in caregiving, the problems in communication, and useful techniques to facilitate communication. Susan offers many creative ideas, solutions and practical strategies to help families build a healthy foundation of care. The final section of the book is a generous resource chapter with websites and phone numbers of where to go for support and help. Space is provided to keep track of information, make notes and jot down ideas. The reader learns and discovers topics for conversation, how to make personal histories and activities to do at home. There is even a section full of jokes and song lyrics. Throughout the book are compelling photographs of the elderly and their families by Lori Burkhalter-Lackey, best known for her work in When I Am An Old Woman I Shall Wear Purple. 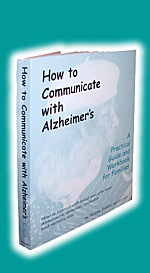 How to Communicate with Alzheimer’s, A Practical Guide and Workbook for Families has significant practical applications for caregivers presented in an easy-to-read how-to format. Take a moment to browse through excerpts and begin learning how you can develop good communication techniques in caring for loved ones with dementia.